Keep the Red Bull away from the players! Now that Red Bull has bought the MetroStars of Major League Soccer, we should expect to see big tubs of the energy drink on the sidelines at Giants Stadium, replacing the Gatorade, right? Wrong. 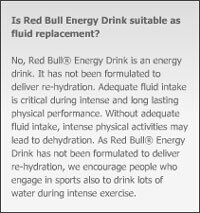 As you can see from Red Bull’s FAQ, Red Bull “has not been formulated to deliver re-hydration.” Chances are, if the Red Bulls were to ingest lots of their namesake brand during games, they’d be a bunch of lethargic, pruny half-men by the final whistle (actually, they often look like lethargic, pruny half-men by the final whistle anyway, but in this case they might need medical attention, too). We hear Red Bull goes quite well with vodka, though. So maybe it’s a good thing Clint Mathis no longer plays for the team. That would just be too much of a temptation.